William Camden (1551-1623) was a contemporary of Christopher Saxton and although not a map-maker, he had a profound influence on the course of map-making, because he provided the vehicle for some of the finest maps ever produced. These appeared over a number of years in his scholarly history of Britain from pre-Roman times, Britannia. Commonly referred to as Camden’s Britannia, it was first published in 1586, in Latin, with no maps. It was not until the sixth edition, in 1607, that a cartographical breakthrough occurred, because this edition, published by George Bishop, was the first work to contain a set of county maps of England and Wales, with each county engraved on a separate sheet. 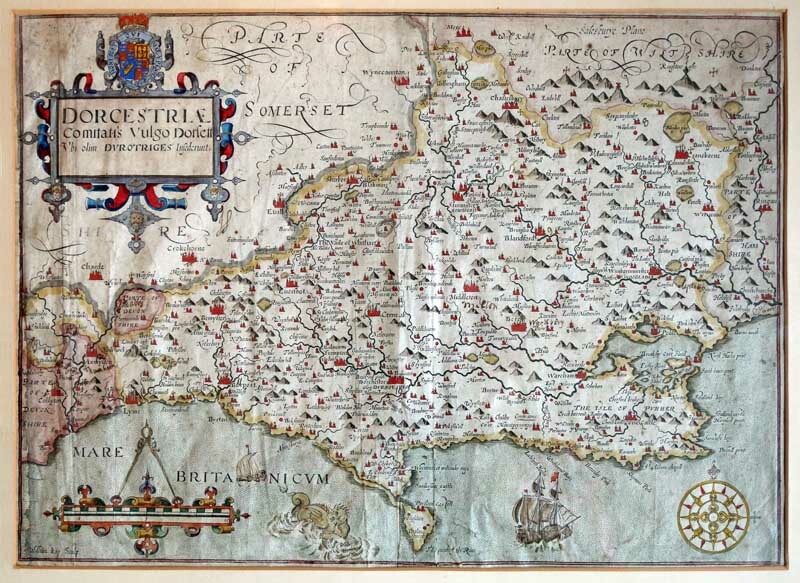 The Dorset map in this earliest Camden series, which measures 38.5 x 27.5 cms (15 x 11 ins), was engraved by William Kip and looks like a scaled-down Saxton, which is exactly what it is (the map is sometimes termed a Saxton-Kip). The maps are very accurate for their period but it is typical of the very earliest style of cartography, in which features such as hills and rivers are drawn on a much exaggerated scale. And also with the traditional galleons and sea monsters in the English Channel. The scale bar in the lower left corner and the compass in the lower right corner are particularly attractive. Although the similarities between Saxton’s 1575 map and Camden’s version are much as one would expect of maps that were copied one from the other, there are differences. The more southerly of the two Holt Forest parks has disappeared on Camden’s map, but an extra one has appeared near Affpuddle. Camden gives greater prominence than Saxton to the ecclesiastical centres with his large, many-spired red symbols. Milton Abbas is written as Middleton, the original name of the town, from which Abbot William Middleton probably took his own name.